I went back to the homeland of New Jersey for some partial business matters that were all totally fun. I enjoyed returning to a camp I once was a counselor at, and saw some of my former campers now 10 years older. A mega change from the 10 year olds I knew them as. I kept telling myself: time flies. Enjoy it and this, and everything... and I did. It felt great to get away from the drawing table or the guitar and just experience civilian life once again (haha)... and of course, seeing my family was amazing. I miss all of them incredibly. It's not like I'm too far off now from civilian life, mind you, but I will tell you, if I can compare my creative output right now to child birth, i'd say I'm giving birth to a small colony... but, more on that later. I'm currently at the tail-end of a month-long workshop at Venice Arts, and the student cartoonist's work this year has been exciting me to the fullest. As promised, please find the cover to the Los Angeles Department of Water & Power cover of, 'Energy Vampires and Water Goblins" below. I penciled the cover, my student Jesse Papik did the inks!.. 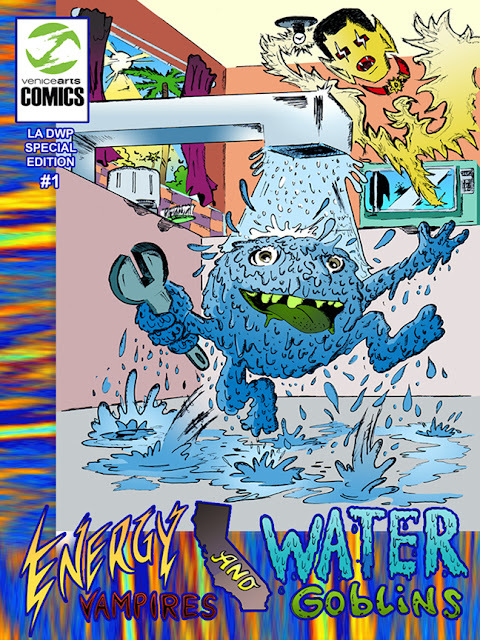 This is a water and energy conservation comic book I lead in a workshop with twelve to fourteen 10 to 17 year olds. I'm super excited to see the change it hopefully brings to Los Angeles!